Yesterday’s “unbelievable” crowd that attended Atiku Abubakar’s campaign rally in Kano, a state whose votes had always been seen as the birthright of Muhammadu Buhari may signpost significant undercurrents in the politics of the North’s most radical state. 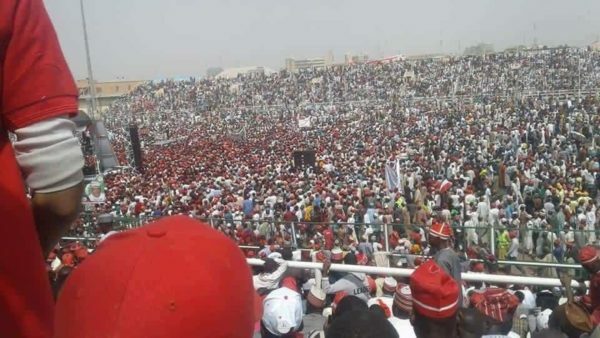 Kano, the hotbed of Northern politics was turned into play yesterday after the Peoples Democratic Party, PDP presidential candidate, Atiku Abubakar turned out what has been dubbed as an unbelievable crowd at a mega rally in the ancient city. That comparisons were being made with the crowd pulled by the ruling All Progressives Congress, APC has now put the PDP as a factor to be reckoned with in this weekend’s presidential election. Kano until now had always been in the pocket of Muhammadu Buhari. He had won the state with massive margins even defeating locals from the state. However, yesterday’s rally which was signposted by the defection of the immediate past governor of the state, Senator Rabiu Kwankwanso from the APC to the PDP has now projected Kano as a state which could to the amazement of the Buhari campaign be hotly disputed. Though suggestions that someone could contest Kano with Buhari could be seen as a fairy tale, the reality after yesterday was that Buhari might no longer be guaranteed the massive margins he had won in the state. Reflective of the new power permutations on the ground, Atiku and his entourage including the national chairman, Prince Uche Secondus had arrived Kano donning the Kwankwansiya cap that is signature for followers of the former governor. That was to show that Kano PDP belonged to Kwankwanso and to reap the votes; the PDP presidential candidate had to kowtow to the philosophy as espoused by the former governor. Indeed, before Kwankwanso’s defection, the PDP which was in the hands of Ibrahim Shekarau was practically lifeless. The party did not contest the local government election that took place in 2016 and had been reduced to sporadic eruptions. However, that began to change after Kwankwanso came to the party last year. An alignment with Shekarau did not work as the later did not consider it proper that Kwankwanso was gifted with 51% of the structure. Shekarau was also in some sections, accused of joining the APC by some PDP members to save his neck from the EFCC on charges of corruption while the APC used him as the candidate to contest for Sen Kwankwaso’s Senate seat of the Kano Central. Corruption has also emerged as an issue in Kano following the video recording of the governor allegedly accepting wads of dollar cash as bribes from some unnamed contractors with the state government. After Kwankwanso defected to the PDP, many serving APC political office holders and associates of the former governor, including the then incumbent deputy governor of the state, Prof. Hafiz Abubakar moved with Kwankwanso to the PDP. Given the bad blood that had emerged between Kwankwanso and Ganduje, the coming battle has largely been constructed to be a personality battle between Kwankwanso and Ganduje. For some, the collateral benefits or damage could then impair or harm the two major presidential candidates, Buhari and Atiku. A major threat to Kwankwanso’s ascendancy in the PDP was the issue of the governorship candidate. The emergence of Abba Kabir Yusuf, a scion of Kwankwanso, as the anointed gubernatorial candidate of the PDP led to mutterings here and there in the state as some stakeholders, especially those who had positioned themselves prior to Kwankwanso’s emergence felt betrayed. Senator Kwankwaso has used his political prowess to bring the PDP back to life in Kano and is also struggling to induce a generational change in the leadership of the state with his anointed candidate Yusuf, who is seen as closer to the youth generation. Ganduje had promised to deliver 5.4 million votes to Buhari, something that was at one time seen as unrealistic. After yesterday’s “unbelievable” crowd at the Atiku rally, that idea is now clearly unbelievable.